Based on our most popular model–the Legend–the harp features a straight soundboard and a rounded (stave) back. It is a full-sized double strung 36-string lever harp, with two parallel rows of strings and two full sets of sharpening levers. Each of the player’s hands have access to all octaves (both treble and bass), providing the ability to play in the same octave directly across from one another–opening up a whole world of unique arrangements. The player can also use echo and temolo effects, and seasoned double strung harpists can even play the harp chromatically. 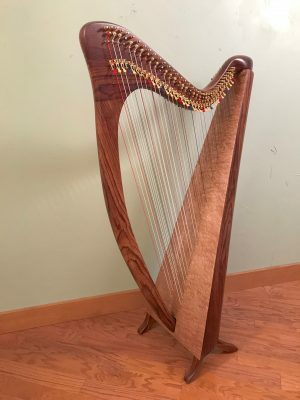 Even with the addition of extra strings and levers, the harp weighs only 13 pounds.